India skipper Virat Kohli struck more than 500 runs in the six-match series which Indian won 5-1 against South Africa and also slammed his 35th ODI ton here. And for his magnificent form on the tour, he attributed none other than his wife Anushka Sharma. 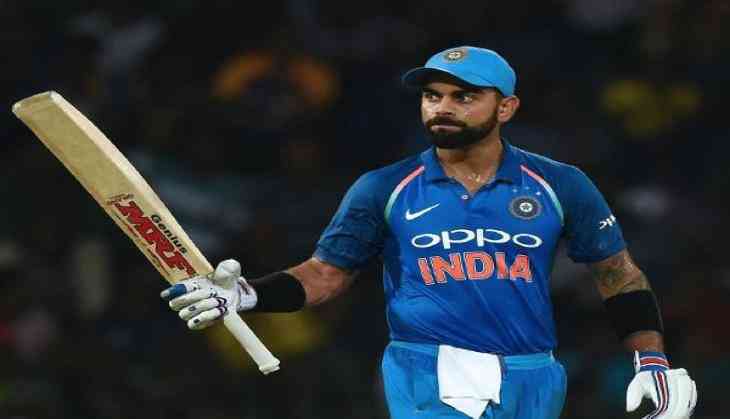 Kohli played an unbeaten knock of 129 as India defeated the hosts by eight wickets in the final ODI at the SuperSport Park on Friday. It was the swashbuckling batsman's 35th ODI hundred. After taking his side over the line, Kohli said, "People who are close to me deserve a lot of credit. My wife has kept me going throughout the tour. I am grateful for that. Obviously, you want to lead from the front, and that's a wonderful feeling." Enjoying his sublime form, the captain also set another world record by becoming the first batsman ever to score 500 runs in a bilateral ODI series. The 29-year old ended the series with 558 runs, which include three centuries (the only Indian to notch up three tons in a bilateral series) and a fifty. "It was a day where I felt really good. Last game, I was not in the right kind of mindset. This is a beautiful place to bat under lights. That's the idea behind bowling first. I like setting up for the short ball. It was a blessing in disguise, and they kept bowling short. I think the pitch got better to bat on under lights," Kohli told reporters. He added, "It's a wonderful feeling. I got 8-9 years left in my career. I want to make the most of it. Want to train as hard as I can. It's a blessing from God that I'm healthy. I'm getting to play for my country. I get to captain my country. It's an honour. I just look at it that way. I just keep my head down so I can give 120% for the team." India will next play three-match T20I series against South Africa that will kick off from February 18.